Srirama Konda is located about 23 Kms from the District Head Quarters of MahabubNagar in the Mandal Head Quarters of Koilkonda and is one of the reputed Historical monuments of the district. 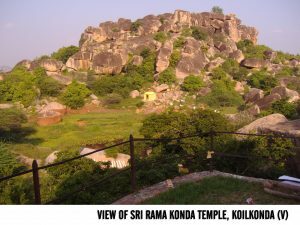 Lord Srirama put his leg in Thretayuga along with his wife Sita and brother Lakshmana when he is in Aranyavasa (forest dwelling) so that this hill is known as Srirama Konda. Lord Rama has stayed here for some time and we can witness the foot print of Lord Rama till today. A stone is known as Sitamma Gundu on the top of the hill on which Sitadevi sat. Many sages did penance or meditation on this hill after the advent of Lord Rama and we can see their dwellings till today and it has become very sacred. Lakshmana became unconscious during Rama Ravana War so Hanuman brought Sanjivani Hill to make Lakshmana conscious. A small piece of this Sanjivani Hill fall in Koilkonda area which has gradually became Srirama Konda.